M. Sundaram, D. Sadagopan, T.V. Girish, K.V. Ramanan and R. Jayaram. In the article (MM, August 1st) V. Ramnarayan has stated that Jolly Rovers was started by K. Balakrishna Rao. It was started during 1947-48 (as informed to Madras Musings in writing a couple of years ago) by my father, late M. Ekambaram and some of his friends. The photo which appears above was taken during 1947-48. R. Jayaram is the surviving member of the club today. He resides in Chennai. “The club was started by a group of college students in 1947 and it was helped to join the league by R. Srinivasan, who was with K.S. Ranga Rao, the then Secretary of Madras Cricket Association. “The name ‘Jolly Rovers Cricket Club’ was suggested by K.K. Shanmuganathan who was one amongst us and the name was finalised. 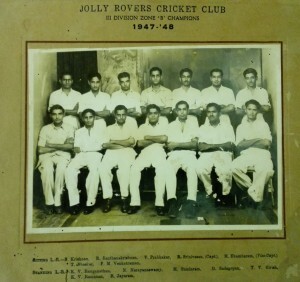 Shanmuganathan could not play for Jolly Rovers Cricket Club as he was successful in the All India Forest Services exams and had to leave Madras for the officers’ training. “The students had no sponsors to run the club and it was run with the pocket money of the students who started it.